Tonight at Activity Days the girls were having an ice cream social. Actually the ice cream was a reward for memorizing the Articles of Faith. I took Megan over for the last few minutes after her game, a 17 - 0 shellacking of the other team. Oh wait, it's not about winning. :-) Mattey ran up and told me she only got one scoop of ice cream because she only has the first four memorized. She got a little happier when she found out that Megan only got whipped cream because she only has two memorized. 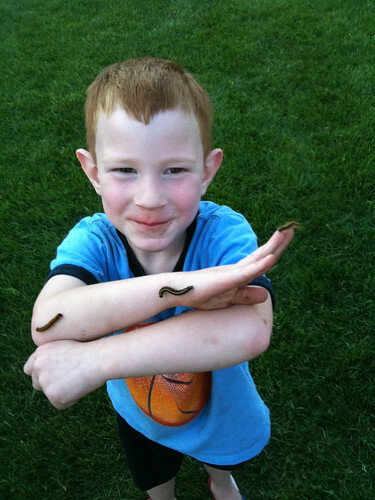 Kade stopped running around outside the church for a second while I snapped this picture of him with three caterpillars on his arm. Cute! He's a brave one.